A close up, you have seen most of this outfit not too long ago. Cardi, top and shoes are different from last time. Im linking up to Every Body Every Wear : Monochromatic style challenge. It's a lovely look, the mustard colour and print on the skirt break up the turquoise enough, and a little hint of red on your toenails is perfect! Love the turquoise! The printed skirt and adorable bloomers are such a fabulous combination. I have no good advice about the polish, mine always comes out terrible when I do it myself. Love all this turquoise! It looks so pretty. Sheila is so smart - even I learned something from her comment. I'm a terrible nail polisher. Love the teals, and the bloomers are beyond cool! Found you via EBEW and added you to my blogroll. @Lynne Devenny - Yep Sheila is the best! :) A warm welcome to you, I hope you will like it here. :) Thanks a lot for your sweet comment! Turquoise is such a beautiful colour on you! I love all the shades you've added, and I think it's nice to have the mustard colour as well. It brings a bit of warmth and contrast. After I got my prescription glasses for reading I got better with the nail polish. It's not quite as messy as it was. But then I'm much older than you so you may have to look for other solutions! These colours are absolutely lovely on you, and I adore your bloomers! Ah, messy, messy nail polish! What helps me with application is doing the first stroke (when the brush is really full) in the middle of my nail, going from base to tip. Then, I spread out the polish using overlapping strokes on either side of my first one, all going in the same direction. Of course, chaos ensues anyway. :) What I do afterwards is dip a Q-tip / cotton swab in nail polish remover and clean up my toes best I can! i agree that the yellow on the skirt helps break up the turquoise (in a good way!). and LOVE the shot of your red toenails peeping from the shoes, soo cute! Yes Monica! I'm definitely 37! and a bit... Thank you so much Dear! I don't think you are breaking any monochromatic rules. 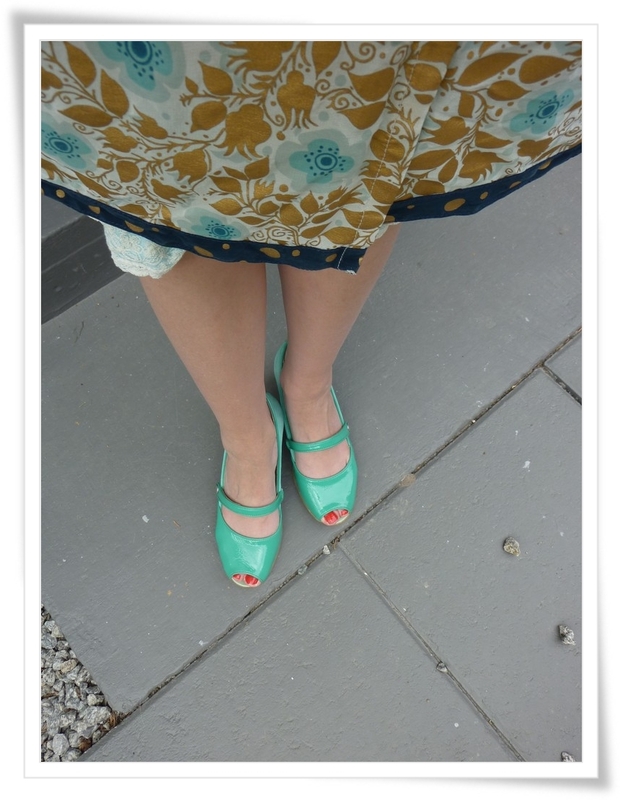 The skirt is loverly and I also think that the red nail polish with the turquoise is a hit. Best Wishes for the weekend. Am following you now too!